When battling a chronically sour mood, sometimes all you want to do is crash on the sofa or take a nap. Too much relaxation, however, can actually worsen the problem, whereas the right workout routine can significantly reduce stress and irritability. 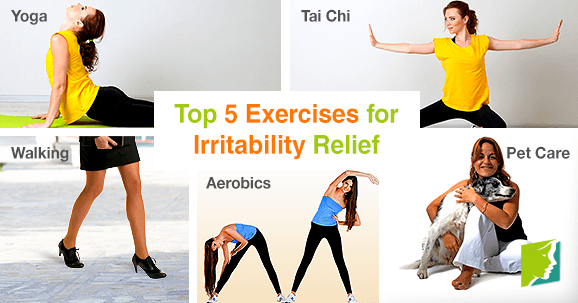 Read on to discover five exercises proven to offer irritability relief. Renowned for its abilities to reduce stress and anxiety, yoga is a top choice among experts for irritability relief. Its focus on stretching and flexibility is great for overall health, and it emphasizes deep-breathing techniques that can be applied when episodes of aggravation strike. These same techniques are also beneficial for recalibrating sleep patterns, thereby reducing the number of bad moods caused by sleep deprivation. Known as “meditation in motion”, tai chi may be slow and methodical, but it is anything but dull. This ancient Chinese practice teaches patience and deliberation, reducing stress and increasing understanding in those who seek irritability relief. Now a worldwide phenomenon, classes are relatively easy to find, with many gyms and other private institutions offering instruction at every level. Perhaps the simplest and most convenient exercise of all, a simple stroll can do wonders for relieving irritability. Walking is a full-body workout even at the lowest intensity levels, and thus it releases tension from major muscle groups such as those in the legs, back, and shoulders. Less strenuous than jogging, worries of injury are kept to a minimum, and it can easily be performed with a friend, partner, or alone. Taking some time outside can go even further to alleviate irritation, as fresh air is thought by many to boost mood. Though yoga has its benefits, not everyone prefers a quiet, meditative tone in their workout routine. Different personalities require different techniques, and higher intensity movement may be better for those who find irritability relief in a cathartic way. Sweating away the stress releases mood-enhancing endorphines while increasing overall fitness, and aerobics classes can form a sense of community that may be missing in daily life. Many feel the best form of exercise is that which feels like none at all, and playing with a pet fits that definition for most. The unconditional love of a furry friend can sometimes provide even greater irritability relief than that offered by human loved ones, as relationships become a simpler issue. A good ownership practice is to make sure that your pets get sufficient exercise, and it may be surprising to learn that playtime can burn up to 200 calories in one hour alone, resulting in improved fitness over time. Simple lifestyle changes to a balanced diet and exercise routine can have a major impact on general health and can safely provide irritability relief. Try one or a combination of the fun workout routines listed above, and feel your frustration melt away in no time. For further information on how to deal with irritability, follow this link.